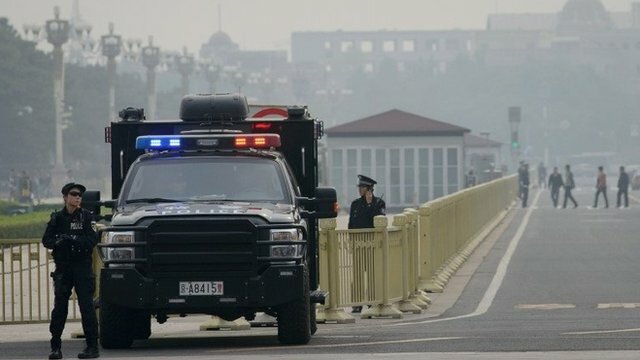 China\’s top security official says a deadly crash in Beijing\’s Tiananmen Square was incited by the East Turkestan Islamic Movement. The crash occurred on Monday when a car ploughed into a crowd then burst into flames, killing three people inside the vehicle and two tourists. Police have arrested five suspects, all from the western region of Xinjiang, home to minority Uighur Muslims. Security has also been tightened in Xinjiang, which borders Central Asia. China often blames the ETIM group for incidents in Xinjiang. But the BBC correspondent in Beijing says few believe that the group has any capacity to carry out any serious acts of terror in China. Uighur groups claim China uses ETIM as an excuse to justify repressive security in Xinjiang. via BBC News – Tiananmen crash ‘incited by Islamists’.